I really should thank Chris and Zachary for that. Mhm. We need to thank them real soon. Maybe write a fan letter? Oh...and this one is beautiful. Sad, yet extremely beautiful and touching. This one, make sure you look up what Pon Farr is before reading. James Sirius Potter wrote: Hahahhahahaah, sammmme. THIS MOVIE...WHERE CHRIS IS GAY...omg. I KNOWWWWW. IT'S CALLED SURRENDER DOROTHY AND HAS DIANE KEATON. Then this is a classsssic...I just watched his mouth the whole time. Yep. 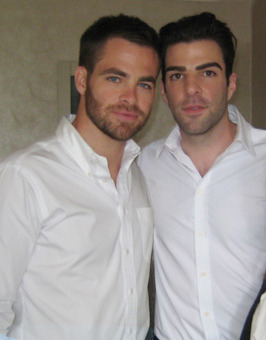 Can we just...have a sleepover and watch every Chris Pine movie? I LOVE THAT PLAN...A LOT. SERIOUSLY. THAT'S A GREAT PLAN. ...oh, and also...I just watched "Carriers"...omg. YOU NEED TO SEE IT, JUST FOR CHRIS. ALSO....I think once school ends...or at least when it calms down a bit and I don't have a million things to do, I'm going to go to the library and rent every movie with him in it. I want to do that at my local library...but the ones I haven't seen are independent films mostly. Except Smokin' Aces...which my school rents and I had in my hands but couldn't remember if it was the right movie but now I know it is and I can't believe I didn't get it. So um, yeah. I'm gonna rent that one like...Friday. I'M TRYING TO GET THE LYRICS FOR SOMEDAY CAME TODAY....BUT LIKE, HE MUMBLES A BIT AT CERTAIN PARTS AND I CAN'T GET THE RESTTTTTT. I figured since you listen to country, maybe it'll be easier for you to decipher. Stop waitin’ for the next bad thing to happen. And I just got through a storm of tears, I thought would never end. Someday was a dream that always seemed to turn out wrong. I'll come on skype and you tell me all about it. I'm pretty much up now anyway after reading that one. Um. I feel like its not my place to be here since IDK. Ijustdo.